Fabric – It is constructed from an organic cotton (93%) & nylon (7%) blend (latex free) to provide a perfect combination of flexibility, recoil & support. Adhesion – Hypoallergenic glue and latex free. However, if you have sensitive skin we would recommend our STANDARD FLEX kinesiology tape. has been designed for athletes. It is lightweight, fast drying and conforms to the skin, providing support and stability for muscles, joints, and tendons. 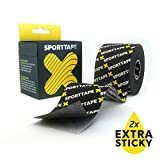 Watch the 50+ application videos – Watch our simple SPORTTAPE application videos. These include runners knee, calf pain, groin strain, tennis elbow and many more. Download our FREE APP – download our FREE app for taping tips, news and exclusive offers on the go.